Not many scenes have been so parodied that they become more famous than the original scene itself. 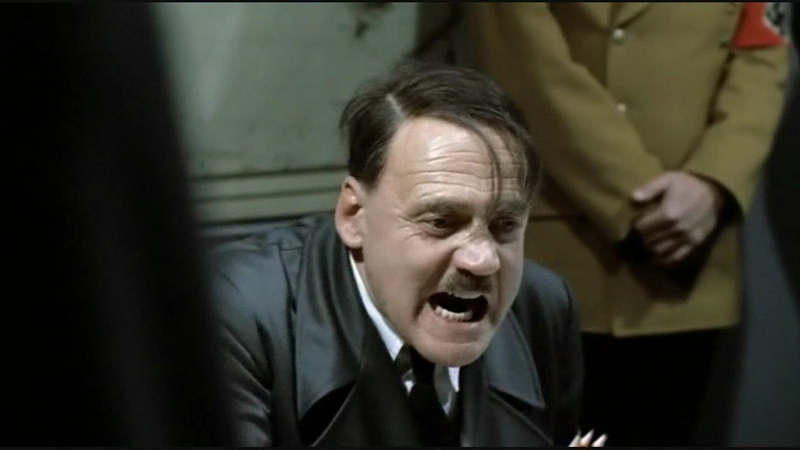 The German dialogue in Downfall meant it was ripe for a change in subtitles and many different comedy versions of Hitler being outraged by something in the news or popular culture were created. What these parodies fail to realise is that they only work because the central performance is so convincing and when you view it as intended, with the original dialogue, it tells the story of one history’s most infamous characters on the brink of self-destruction. It would have been very easy to play Adolf Hitler as a caricature rather than a serious, believable character. He has been parodied, mocked and brought to the screen in so many ridiculous ways that it is refreshing to see a more realistic portrayal of the dictator. This is down to the incredible performance by Bruno Ganz, who runs the whole emotional gambit in one 3 minute scene. Even as frail as he seems in this scene, Ganz still holds a commanding presence. As the generals and Nazi officials feed-back the news that Hitler’s orders have been disobeyed, he sits silently, listening, judging and eventually giving his opinion on the bad news he has received. The fear felt in the room is palpable and when Hitler reels off the list of people he wants to stay, the quick shuffling of (relieved) people leaving the room tell a story about the fear that Hitler struck. That frailty is never too far away though. Downfall is the story of Hitler’s final days and Ganz conveys this perfectly here. It is subtle, just a shaky removal of his glasses, placed carefully on the table. Almost as soon as those glasses hit the table, Ganz changes that performance once again and begins the now infamous tirade, scorning his generals, soldiers and anyone else who will listen. This could have been very comical, overplayed and ridiculous but in the context of the scene, with the many different concerned, shocked and upset witnesses, both inside and outside the room, it becomes a believable and incredible performance. Ganz portrays the outrage of a man who has realised his war campaign is lost. It is frustration, desperation and anger in a minute long rant and it works perfectly. It is all finished as soon as it has begun with the quiet words, almost whispered to those in attendance; The war for Germany is over. 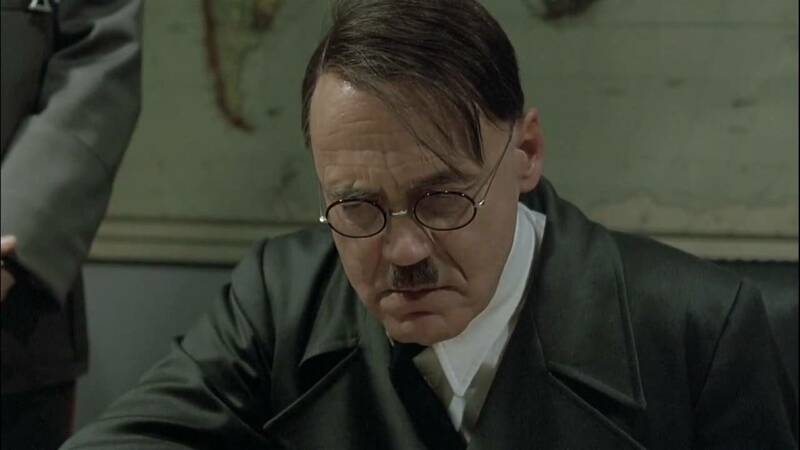 It is the first time in the movie that the idea of Hitler committing suicide is mentioned but for the history buffs watching, it will become a foreshadowing for events which will come to past in the movie. Overall, Hitler’s outrage in Downfall may be one of the best gifts to anyone parodying on the internet but is also testament to how good an actor Bruno Ganz is. The whole scene is a heavyweight performance and Ganz gives his all in one of movie’s greatest moments.